While there were many reasons for our ancestors not smiling in their portraits, one look at this torture chamber might give you a clue. Even when exposures were only four or five seconds some photographic studios continued their use. Farewell to thee, old, time-worn Friend! For "every dog must have his day." Many secrets you could tell. Your firm embrace has held them all. ONE by one the constituents of the photographer's conventional studio equipment are reaching the end of their usefulness and are fast disappearing. That old, familiar accessory, the head-rest, is among them, and with it what was once an important industry. Its disappearance has been preceded by the burnisher, a heavy, clumsy, troublesome and time-consuming implement, and no one has regretted the end of its brilliant career except the manufacturer and the dealer, both of whom profited considerably by its sale. The cold, firm clutch of the head-support rarely, if ever, contributed to the much-sought-for pleasant expression, neither was it calculated to impart ease or grace to the pose of the sitter, and the adjustment of its burly form was often accompanied by startling and ominous sounds. Yet it managed to hold sway for more than half a century, until, with the advent of high-speed dry-plates, its use has become more and more restricted, so that only a few studios continue to recognize its utility. Many eminent practitioners have ceased more than ten years ago to work with the head-rest, and would prefer to give up portrait-photography than to resume its use, on account of the psychological and irritating effect of the instrument upon the sitter. 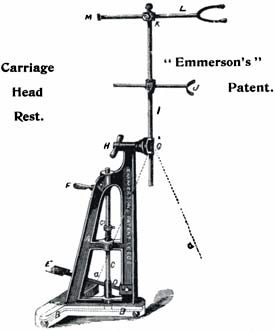 Those workers who have taken this advanced attitude claim that the head of the sitter, freed from its restraining influence, is disposed to oscillate gently in the direction of the lens, out of the plane of optical sharpness, thus producing a degree of indistinctness highly desirable and which could not be obtained in any other way. On the other hand, one finds here and there a practitioner who still clings with affection to the accessory, finding it quite useful during necessarily prolonged exposures when the light is weak, or for other reasons, in which cases the support is not pressed against the head or neck of the sitter, but rather against the crown of the hat and accompanied by a remark calculated to divert the sitter's attention. All the same, the days of the ponderous, rattling source of irritation are practically over and will soon pass into the realm of forgetfulness. Note: You can see the stand behind the young girl in the photograph above. The Passing Of The Head-Rest. Photo-Era: The American Journal of Photography. Boston: Wilfred A. French, 1909. 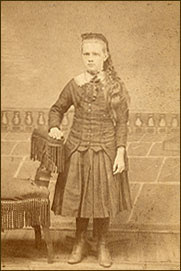 Young Girl With Head-Rest Stand. Photograph (Cabinet Card). Unknown. Privately held by the footnoteMaven, Preston, Washington. 2009. I'm in love with the iPad app that marks the 150th anniversary of the Civil War produced by the History channel. While the app costs $7.99, you will receive real time "This Day in Cvil War History" updates every day. It features photos, newspaper clips, and first-hand accounts from the war in the form of letters and diary entries, and help using Morse code to send telegrams via Twitter. It's a hoot, and a bargain when you consider you will be receiving daily updates that let you live the events in “real-time” over the course of four years. The app also uses the iPad's multi-finger swiping feature allowing users to navigate through time. History says a one-finger swipe moves a day, a two-finger swipe for a week, a three-finger swipe for a month, and a four-finger swipe can jump the user one year in time. “In the Headlines” featuring newspapers from every day of the war. Running tallies of the North and South casualty counts. “A Day in the Life” with personal letters and diary entries from 15 individuals including Abraham Lincoln, Horatio Nelson Taft, and Mary Boykin Miller Chesnut. Photo of the day and photo galleries. Articles and video on featured topics. Authentic period maps from key battlegrounds. Detailed background scenes that put you in the time and place of the Civil War. (Northern city, Southern plantation, Western frontier town, military camp). Twitter integration to send a telegram via Morse code. 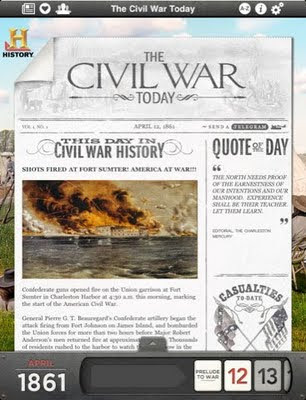 GameCenter integration to earn Civil War era appropriate achievements - and display them in a virtual medals case. Airplay integration for viewing of app video via Apple TV. Advanced multi-finger gesture functionality and custom toolbar for deep navigation. It's everything you could wish for in an app. You can find it in the iTunes store.